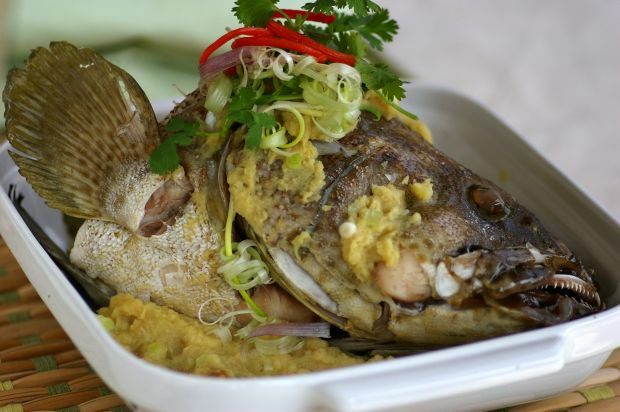 A delicious steamed fish with ginger paste for the upcoming CNY! Rinse fish head well and wipe dry. Season with the salt, pepper and rice wine. Set aside for 25 minutes. Blend the old ginger, garlic, shallots and coriander in an electric blender to a fine paste. Add the seasoning and mix well. Heat 2 tablespoons oil in a non-stick frying pan over medium heat and fry the ginger paste briefly, until fragrant. Dish out. Place fish head in a heatproof shallow plate and steam for 10 minutes over high heat. Remove from heat and carefully drain away the steaming liquid. Spoon the prepared ginger paste over the fish head and steam over high heat for 12 minutes, or until cooked. Garnish fish head with coriander leaves, spring onion curls and chilli curls. Do I need to use rice in this recipe? Is there an alternative ingredient as I am a Muslim. You can substitute rice wine with apple juice, white grape juice or even lemon juice. The acid in the juice acts as a tenderiser in stir-fry marinades. However, the flavour will be slightly differ from the original.